Today is Saint David's Day, the day of our national patron saint of Wales. I thought nothing says Wales like our industrial heritage, so off to Rhondda Heritage Park we went. It was one of those days that tricks you into feeling that Spring has arrived, only to blast you later on with some icy showers. We took advantage of a brief sunny spell to take some photos outside. Some of the things stereotypically associated with Wales include male voice choirs, coal miners, sheep, Welsh rarebit, rugby, daffodils, and ladies in black pointy hats (a bit like the pilgrims). 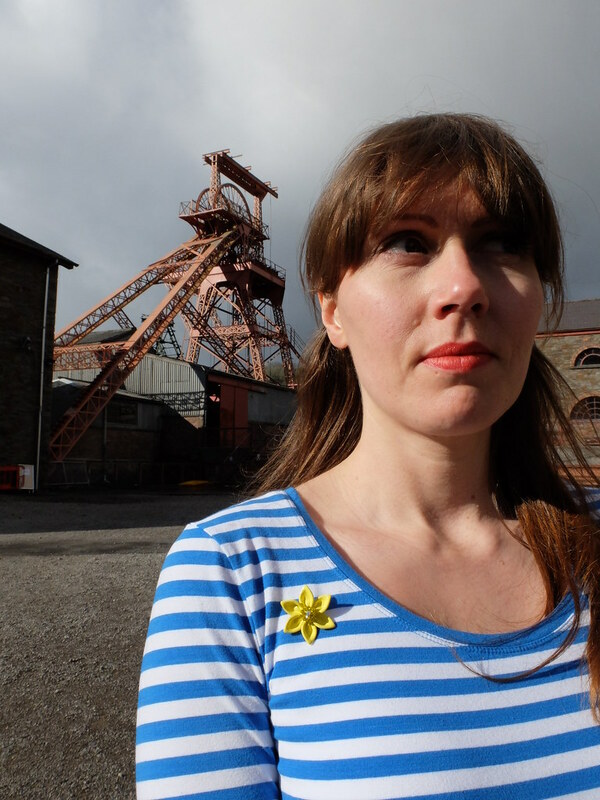 It's traditional on Saint David's Day to wear a leek or daffodil badge pinned to your clothes, and I was delighted when Eternal Collection got in touch to ask if I would choose something from their collection, as they had this incredibly pretty daffodil brooch on offer. 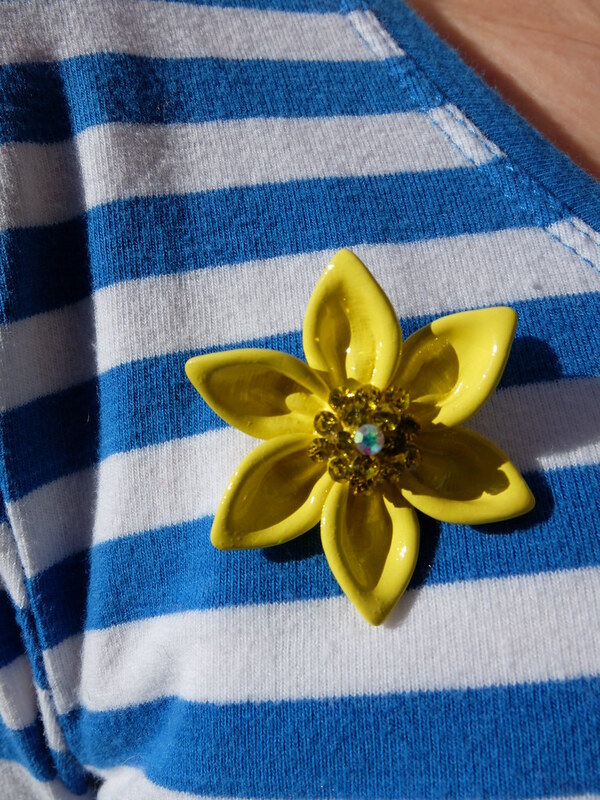 They have a wide range of jewellery but the brooches are particularly nice, and fellow bloggers CiCi & Marie and Amber have both been sporting some recently. 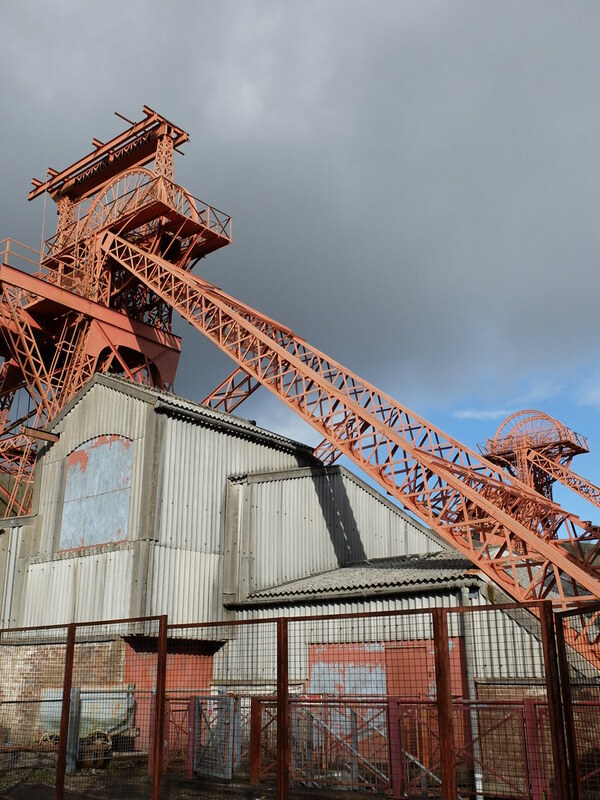 If you're in South Wales, Rhondda Heritage Park is only a short drive from Cardiff and is worth a visit (Rhondda is pronounced ron-the with a slightly rolled r). The site has a re-created indoor street, an art gallery, a cafe, and outside you can see mining equipment and structures, and even go down the mine if you want to! We stayed above surface for our visit this time, which is all free of charge. There are also walks and cycle routes that start at the centre, and next door there's a pub. To celebrate, we'll probably have a nice bit of Welsh lamb for our Sunday dinner and perhaps have some hearty singing around the newly-tuned piano. Are you doing anything for St. David's Day if you're in Wales? Or do you celebrate a different Saint's Day? I was kindly sent the brooch for review from Eternal Collection. All words and opinions are my own. How wonderful! It's funny that my grandpa who is welsh continued on being a coal miner and a farmer long after he came to Australia. He died at the ripe old age of 92 just after I was born but apparently he was always very Welsh to the very end. I love your outfit, white and blue stripes are just one of my favourite things, they look so wonderful. The Welsh have been very well-travelled in history, that's great that your Grandpa made it to the sunny climes of Australia! I didn't know there was any coal mining in Australia until I saw it on a programme recently. I've never been to Whales. It does look lovely though. Love the little yellow pin. Blue and yellow are always so fresh together. 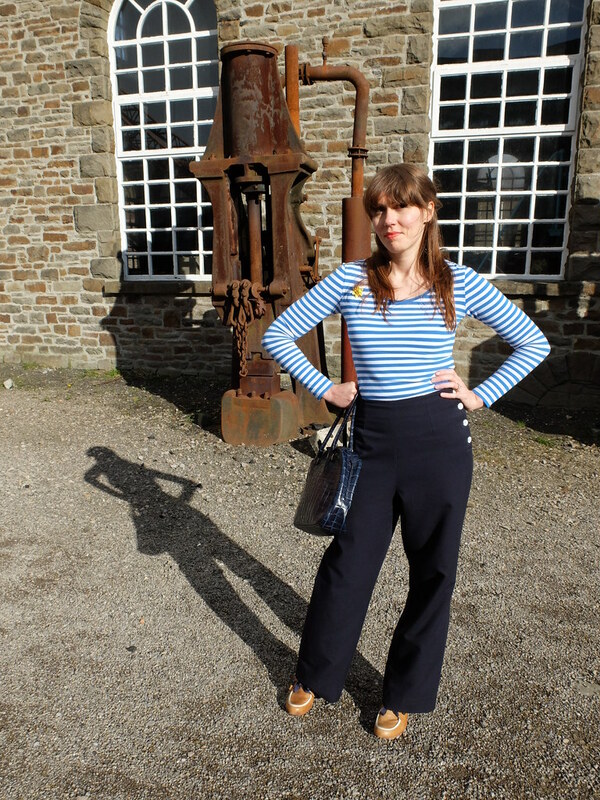 I am so tempted to buy some swing trousers - they look really good on you! Those nautical trousers are beautiful Porcelina. Great look - a little retro, a little masculine and 100% sophisticated! Happy St. David's Day!!! Love this outfit! It feels so fresh and perfect for spring. For a long time I avoided horizontal stripes for the most part due to their potential to make one look wider, but they've grown on me big time in recent years after seeing many of my stylish fellow bloggers rocking them and not running into that (so far as I could discern). 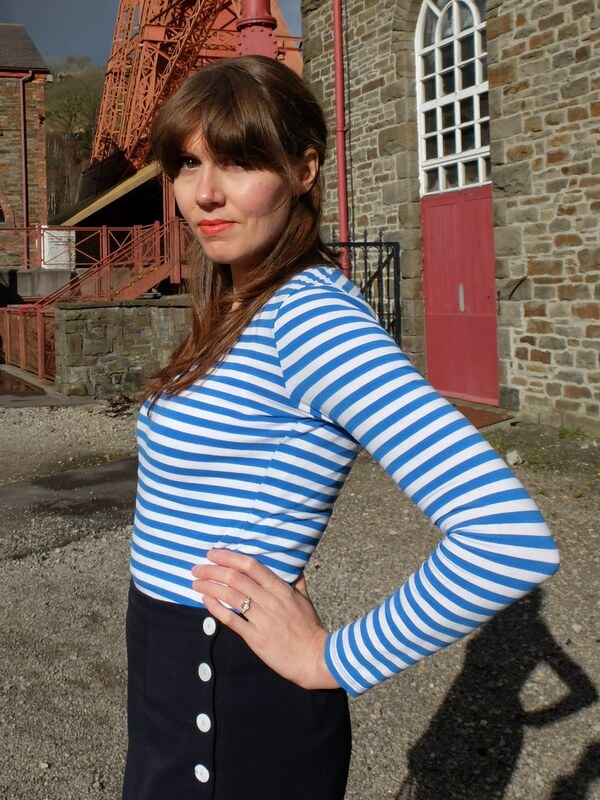 In fact, I just thrifted a charming nautical perfect vintage appropriate stripped shirt a couple of weekends ago and can't wait to wear it when the weather finally warms up here again. Marvelous trousers, there is something so very chic about this outfit and that last picture is outstanding. This outfit was PERFECT for the setting and I am in love with those pants. 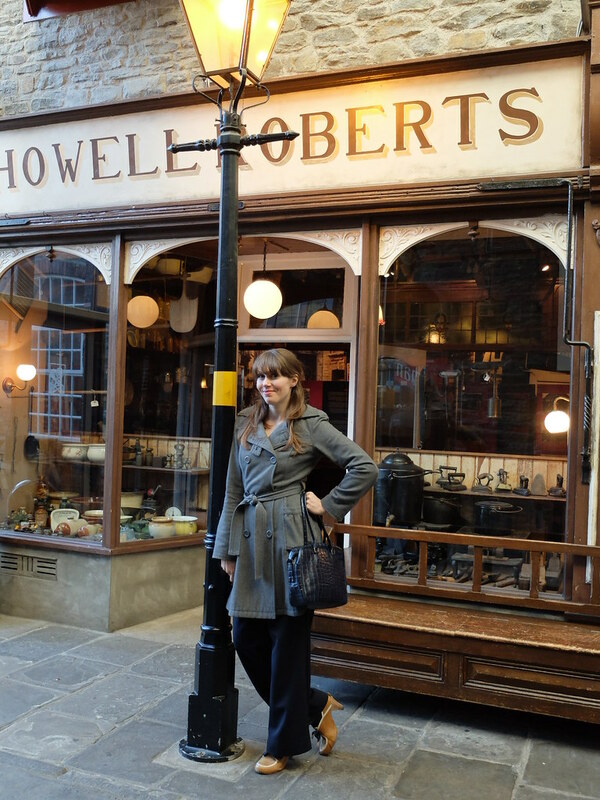 Ugh, why couldn't I be jsut a bit taller to embrace the awesome wide leg pants movement! Thank you so much for linking up beautiful lady! What a great backdrop for your photos! I love your broach and those pants! That's a cool pair of pants! I love the buttons on the side and the high waist! Oh I'm loving that brooch! It's so spring like and would look lovely on so many outfits. I think I might have to get one myself. Sounds like a fun day of celebration. I love those pants on you and the yellow floral brooch is a perfect touch for the day. Love everything about your outfit! So well put together! I especially love how those shoes and that brooch seem to really pull everything together <3 Sounds like it was a lovely day!